Felipe has been working and saving money for the last 17 years, much of which he sends back to his family, a wife and four sons, in Mexico. He wants to finally make good on his promise to leave Brooklyn and return to them in time for the birthday of his youngest, who he’s never seen. But financial problems and a sneaking suspicion that his family may be more interested in his money and less in seeing him forces him to postpone his trip. So, he keeps working his odd jobs: collecting cans, mopping floors at the local bodega, hauling bags of cement for the construction crew. 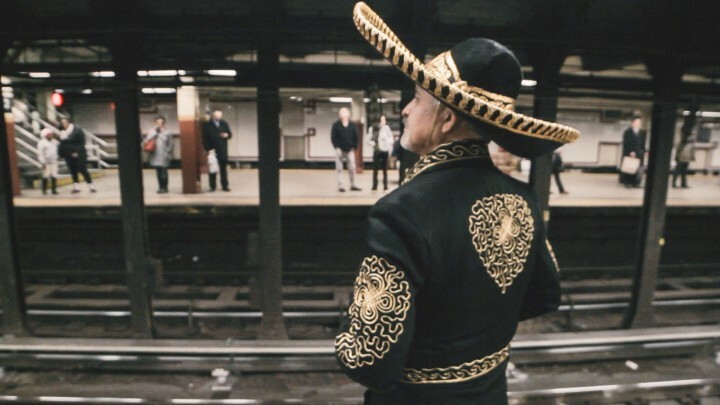 Even while working, Felipe wears an extravagant black sombrero, a mark of his sly sense of humor and his individuality. His family may be disinterested and frittering away his hard-earned cash, but Felipe retains an enthusiasm for his dreams. Directors Lindsey Cordero and Armando Croda keep their camera close to Felipe throughout the film. They’ve set their camera’s shutter on a faster speed, which enhances their close-ups with a jittery, homemade aesthetic, as if an unseen presence exists mere inches from his face. The intimacy is stark, even uncomfortable at times, suggesting an affinity with the Mexican master Carlos Reygadas, but there is no escaping the revealing authenticity of Felipe’s humanity. He works hard, doesn’t drink or do drugs, and lives in a tiny spare room where the stovetop doubles as a cutting board for his avocado and tomato tortas. He’s no saint. He swears angrily when one of his adult children tells him the business back home is bankrupt. Though he professes love for his wife–a woman we hear only through Felipe’s unsatisfying phone calls home–he has a girlfriend on the side. He is tempted by the relationship to never return to Mexico, but even this possibility seems tenuous. Framed as a simple human interest profile instead of as a political statement about an undocumented worker, Ya Me Voy impresses with its quiet, poetic simplicity. I found myself enthralled by its unassuming grace and its flights of imaginative, subtle staging. It’s these kinds of films that play in the smaller theaters of film festivals, while the lumbering, over-funded monsters of the high-impact doc world get most of the attention.